Don’t let Porto’s distance from Lisbon stop you visiting Portugal’s second city. Travel and sight see with ease on a private 12-hour tour, ideal for visitors with limited time in Europe. Relax in an air-conditioned car throughout the 3-hour journey before you embark on a whistle-stop tour of Porto’s main monuments, which include the Ribeira District, Porto Se Cathedral, and Torre & Igreja dos Clérigos. Plus, you’ll cross Ponte de Dom Luis I and sample port wine in a cellar. Hotel pickup and drop-off are included. We have joined the 6 Bridges Cruise at Porto which was recommended by our guide Diogo (at own expense). 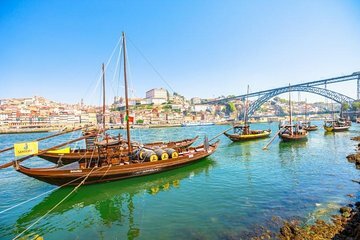 The cruise was nice but it did taken up our available time in Porto, especially when this kind of cruise tour was arranged in fixed schedule by local operator and you need to wait for the next cruise. Our guide did tried his best in bringing us to all the attractions we were interested in visiting. As it is a private tour, it is easy for you to forget about time management. For us, we spent too much time in Livraria Lello, and as a result, we needed to rush to other attractions for quick visits. So, if you are joining this kind of tour, do plan ahead the time you'll spend in each attraction! From the very beginning we knew things were not going to go well. The guide showed up 30 minutes late as he had been stopped by the police and did not have the correct documents. He then apologized for his poor English, and said that he had never been to Porto where our tour was and that we would discover it together. About halfway through a terrifying, fast car ride, we learn that he does not even have a list of the sites he is supposed to show us. Relying completely on Google Maps which he was going too fast to follow, he was unable to find the location of the Port tasting which was supposed to take place in the afternoon- because who wants Port at 11:30am?. After I pulled out my Google Maps, I navigated him to the location for the tasting after being lost for an hour. However, we had missed the first slot, and wasted a further half hour for the tour to start. At this point we decided to take matters into our own hands and showed him a list of the sites we were supposed to see and plotted the points on Google Maps. During our time spent waiting, we called the office of the tour company and were hung up on while trying to explain the situation. We were eventually called back after several attempts, but the situation was not remedied. He followed us to these sites that we had planned, walking slowly behind us and asking locals randomly for directions that were nearly always wrong. The tickets for Calem the Port tasting were included, but none of the other sites were. This was very misleading from the Viator description. At some point during our day, he disappeared and popped up later and said that he was busy having lunch. We found this odd as we had not had lunch either. Our last stop of the day was the Stock Exchange, but were unable to tour as tickets were sold out for the rest of the day. This was a foreseeable circumstance that an experienced tour guide or tour company would have been able to foresee. While Porto was beautiful and highly recommended with another tour company, this was far from a relaxing, well organized day. We felt very unsafe due to our guide's reckless driving and were guiding ourselves throughout the day, which made him redundant. My wife and I had a great day trip to Porto! 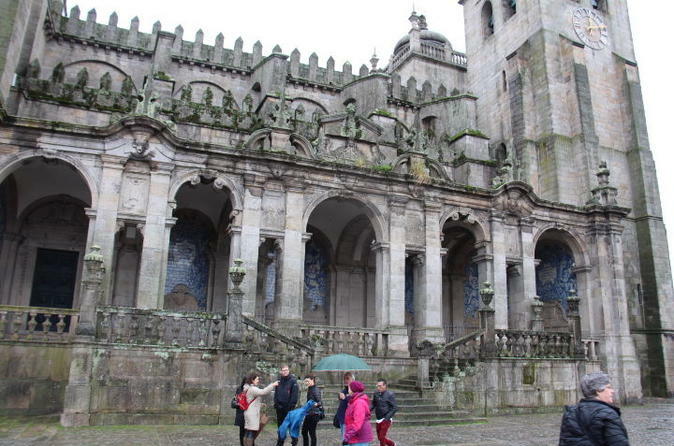 Although it was rainy, our guide showed us the major sites/churches of Porto. We had great views of the city and river despite the rain. Lunch was in a local restaurant with locals. we love that-simple meal at reasonable prices. Since we had spent much of our time in Lisbon, we really didn't need to have more cod recipes! After seeing the tower and three churches, we also saw the bookstore where Rowling wrote Harry Potter long line, we just peaked in. Then we had a Port wine tour for an hour, thanks to our guide! In the end we went home happy and tired. Because our trip was in December, we couldn't get out to the shore in time since it got pretty dark by 5:30. We recommend this tour! Disappointing. The guide was a nice guy who functioned more as a driver than a tour guide. He never once told us why he was dropping us at particular sites. Just said, okay, go look at this or climb that. I would have liked some more context. The only way I got any info was by asking, over and over. Also, he was not as knowledgeable as I would have liked. For example, we were walked to this beautiful train station that was filled with painted scenes. When asked what the scenes were, the guide had no clue. Well, why take us there if you don't know? Do your homework. This was a very expensive tour, primarily because of the Lisbon pick up and drive to Porto, I guess. I felt nickled and dimed, because everywhere we went I had to pay an entrance fee. The fees weren't big, but still, the tour cost a lot and I don't see why these fees were not included. The only thing included was the Port tasting, which was fun, but the guide had no idea we had paid for it, had to verify, and then scramble to find us a tasting. Why? All in all, not very professional. Had I known all of this, I would have taken a train to Porto and booked a local tour.  My experiece was excellent. My tour guide, Daniel, was knowledgeable, very attentive and willing to please. He was on time and informative. Made us feel relax and we were able to enjoy our tour. Excellent. It was a long drive from Lisbon to Porto but Porto itself merits seeing. Our driver Daniel was great and informative once we got there. There was a problem getting in contact with the local company doing the tour as we did not have a phone to use and I tried 4 internet searches to contact them of our hotel for pick up. I had my fingers crossed that one of the messages got through and only heard the afternoon before our morning departure that they did have our hotel information. We rode in a comfortable and roomy van which was nice. Great visit at the Pinta ? distillery and wonderful guide there as well. One of the oldest Port distilleries in Porto and the tour allowed us to see the process as well as a liberal tasting of the different kinds of Port. 3 of the sites visited required @ 5 Euros each to visit which seemed , given the price of the tour, a little high and I felt should have been included. Beautiful churches and areas were visited.